How can I put this? 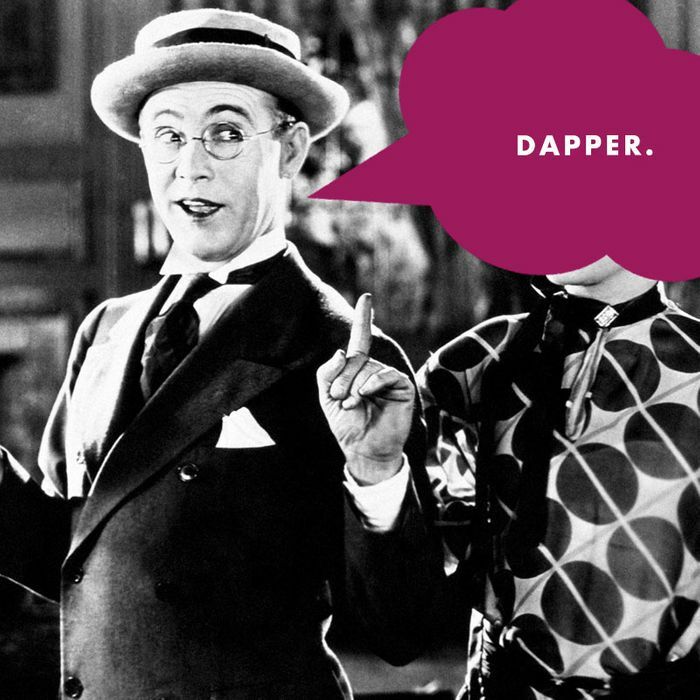 I know dapper is meant kindly, but the word carries implications that few men actually want to be associated with. Dapper compliments effort, rather than effect: “Aww, look, you tried.” Listen for it and you’ll start to hear it everywhere. Today, dapper seems to apply to any human male wearing a shirt that isn’t a cropped mesh pinny. Dapper will make even the most pomaded dandy wince, his toes curling in his brogues. And it will make your run-of-the-mill button-down-and-scruff guy wonder how bad he must have looked on workdays past to deserve dapper today. Straight white guys (like me) are generally — and somewhat sadly — socialized to be uncomfortable looking like they’ve tried too hard with their appearances. And dapper is basically calling them out making an effort — whether or not it’s deserved. I’m sorry. I know I sound terrible. Complaining about well-meaning compliments makes me the apex of ungentlemanly. But I should confess: I’m implicated, too. I’ve used dapper to describe literally thousands of men — or, rather, I’ve dropped it into the inboxes of thousands of men, exhorting them to join the ranks of dapper fellows everywhere. And, boy, do I ever regret that. For several years I’ve worked in content marketing in the men’s-grooming industry — so no one is more painfully aware of how few and inadequate are the synonyms for handsome. But it wasn’t until I found myself sitting in the corner of a focus group, listening to a dozen young professionals describe their emotional reactions to the word dapper that I understood just how far this term misses the mark. “It sounds … like something my mom would say,” pronounced one 20-something, grimacing before he took a bite of a complimentary turkey sandwich. My brow beaded with texture-paste-infused perspiration. My knit tie suddenly felt like it was strangling me. What had I done? Think of the teenage son trying on an oversize rental tux for sophomore-year winter formal, or the younger brother who just discovered desert boots. The effort involved can be real or imagined: Think of that Instagram of your friend’s “dapper” toddler dressed in suspenders at a Kentucky Derby party (“dyinggggg”). Or the “Menswear Dog,” that obedient, agency-less, heavily monetized Shiba Inu grinning in a turtleneck or a camel-hair coat. True, there are plenty of people (both men and women) in the year 2016 who embody dapper in both effort and effect: Tom Wolfe, Gay Talese, Dapper Dan, the trendsetters of the Dapper Chicks Movement. These people are taking direct aim at dapper and hitting the mark. Your co-worker who opted to tuck his flannel into his jeans today, on the other hand, is not. Trust me, he’d prefer that patented tuck-in move come off as effortless. So if dapper is out, what’s in? Sharp, put-together, handsome, on point, fresh, crisp(y), cool, well-appointed, killin’ it — heck, even something like natty works. But even better than those terms is specificity. It’s the simplest way to pay someone a compliment on their terms. It’s easy to flap your arms and say, “I love what I see with … THIS whole … situation,” but it doesn’t feel as good as “I like your fuzzy herringbone sport coat.” The overuse of dapper is a symptom of menswear outpacing our own vocabulary for men looking good. The same goes for guys. I’d love to hear that you think my pompadour fade is a good fit with my head shape. Or that my band collar reminds you of Dustin Hoffman in Kramer vs. Kramer. Or that you know I’m wearing pleated pants in the pleated-pants-are-back way and not the dad-in-Dockers way. Or we could just use our office-kitchen time to look at pictures on your phone of your pug wearing a bow tie on his birthday. That’s one dapper little fellow I’m happy to coo over.